The Summit County Opiate Task Force provides trained speakers for groups interested in learning more about the opiate epidemic. Speakers are able to provide the latest data and will tailor the content to the group or community they are addressing. If you are interested in scheduling a speaker for your business, church or civic group, please call 330-762-3500. If you are interested in scheduling a speaker for your business, church or civic group, please call 330-762-3500 or complete the form on the Contact Us page. Start a conversation with the young people in your life to make sure they know the facts and help give them tools to keep them drug free. Start Talking! – Ohio provides excellent resources for adults to use in teaching kids about how to avoid substance misuse. NIDA for Teens – The National Institute on Drug Abuse for Teens (NIDA for Teens) provides educational materials and interactive games for teens, teachers and parents. Become a member of the Summit County Opiate Task Force youth led prevention program at your school Project P.A.N.D.A. - Teen Institute. If your school doesn’t have a youth led prevention program, contact Project P.A.N.D.A. at 330-315-3761 to get involved. Project D.A.W.N. - Family members and concerned friends of persons addicted to opiate medications or heroin now have access to a new tool in case of an overdose. The administration of Naloxone (also known as Narcan) is saving lives in Ohio. Project D.A.W.N. (Deaths Avoided With Naloxone) is a community-based overdose education and Naloxone distribution program where participants learn about: recognizing the signs and symptoms of overdose, distinguishing between different types of overdose, performing rescue breathing, calling emergency medical services, and administering intranasal Naloxone. Every Wednesday from 4 p.m. to 6 p.m., Summit County Public Health offers the Safe Summit Needle Exchange, which provides an anonymous, free, safe needle exchange for Summit County residents with substance use issues. The program accepts used needles that are secured and safely transported in exchange for new needles. Participants are limited to 30 needles per week. Prevention aims to reduce underlying risk factors and promote protective factors that affect the likelihood of developing behavioral health disorders, including substance use disorders, mental illness, suicide, problem gambling, etc. Evidence shows that the initiation of substance use early in life contributes to higher levels of use and possible addiction later in life. Early onset is also associated with the likelihood of later negative health, social, and behavioral outcomes including physical and mental health problems, violent and aggressive behavior, and adjustment problems in the workplace and family. The Summit County Youth Risk Behavior Survey (YRBS) was completed in 2013 with 19,338 students in middle and high school responding to questions related to their health and risk behaviors. This survey is a baseline measurement and has helped to inform initiatives funded by both the ADM Board and Summit County Public Health targeting affected areas of the county. The ADM Board believes in the value of investing in prevention, early intervention and health promotion across the lifespan in order to prevent or reduce the impact of mental illness and/or addiction disorders. Learn more about ADM Board funded prevention programming here. Ohio Attorney General Mike DeWine published the Ohio Study Committee on Drug Use Prevention Education in February 2017, which looks at the current state of drug use prevention in our state and issues related recommendations. Ohio’s Prevention Action Alliance serves as a resource for programs related to the prevention of substance misuse and the promotion of mental health wellness. ADAPAO is a membership-based, not-for-profit association that serves as the voice of prevention in Ohio, with a specific focus on preventing alcohol, tobacco, other drug abuse and other behavioral health problems. All of us can play a part by properly disposing of outdated or unused prescription medications. Taking the time to use one of these disposal methods can help prevent the unwanted / unused / outdated medications from falling into the wrong hands. Drug Take Back Days - The Drug Enforcement Agency sponsors National Prescription Drug Take-Back Day twice per year. These events provide a safe, convenient, and responsible means of disposing of prescription drugs. In 2016, Summit County residents turned in 3,037 lbs. of medication. Summit County Public Health partners with other communities to provide drug disposal sites throughout the community. Dispose of Unused Medications Properly “D.U.M.P.” boxes are a safe, effective way to dispose of medications in the form of pills, capsules or liquids. Simply take the unwanted medicine to one of the several D.U.M.P. box locations throughout the county, and the medication will be safely destroyed, no questions asked. Deterra drug deactivation pouches – Summit County Community Partnership received a donation of 40,000 Deterra drug deactivation pouches from Mallinckrodt Pharmaceuticals that are available for Summit County residents to safely and easily dispose of prescription medications. The pouch deactivates prescription drugs and renders remaining contents safe for landfills. After filling the specially formulated pouch with pills, add tap water, then it can be sealed and thrown away with household trash. Acme Fresh Market Pharmacies are providing a pouch with each opiate prescription or receive a FREE pouch by request at 16 of their locations. Contact Summit County Community Partnership for additional information at 330-374-0947. Watch a Deterra bag demonstration. When a loved one passes, properly dispose of all of their prescription medications. Discuss alternate ways to manage your pain that don’t involve prescription opioids with your doctor. Some of these options may actually work better and have fewer risks and side effects. Ask your prescriber about over-the-counter (OTC) or non-narcotic options and only fill prescriptions when needed. Learn about the benefits and Risks of Prescription Medicines with this website: Talk before you take. TakeChargeOhio teaches how to safely manage pain and how to have a discussion with your doctor about whether medication is appropriate for you. Are you at risk? Take the Opioid Risk Quiz. Even when recovery is achieved, it can be difficult to reintegrate into society. Those with prior drug convictions may find it challenging to find jobs, get licenses, receive benefits and support children. Ironically, many of the things necessary to increase the chances of long term recovery can be difficult to obtain. Language can be a powerful tool to help others gain an understanding about addiction as a chronic health issue. Stigmatizing words are hurtful and may keep people from seeking the help they need. These guidelines from the Addiction Policy Forum remind us all that we should choose our words carefully. This June 11, 2017 NPR commentary makes the case for the importance of using respectful language when referring to someone with an addiction: Why We Should Say Someone Is A “Person With An Addiction.” Not An Addict. Rock & Recovery is an online HD radio listening experience produced by WAPS-FM in Akron, Ohio. 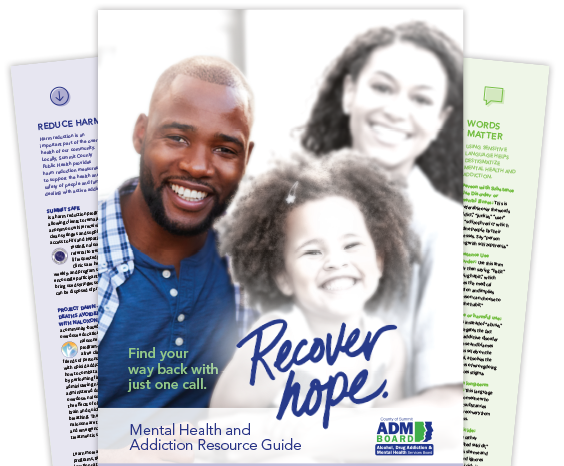 Rock & Recovery mixes inspiring stories and messages of strength and hope from professional healthcare providers, the recovery community, comedians, and family members. These powerful stories and meaningful messages are carefully woven in between handpicked music. This music is uplifting without being preachy, spiritual without religion, and familiar to a wide audience. Visit www.rockandrecovery.com.